One of the things I’m learning is that it is hard to keep up with processing images when one collects 10GB in one night, and does not have the right tools (computer; stacking software) to do the job best. The other thing I’m coming to terms with is that despite having spent several years working against technique in photography and camerawork, this project simply demands that I pay closer attention (than, say, Blurry Canada demanded). 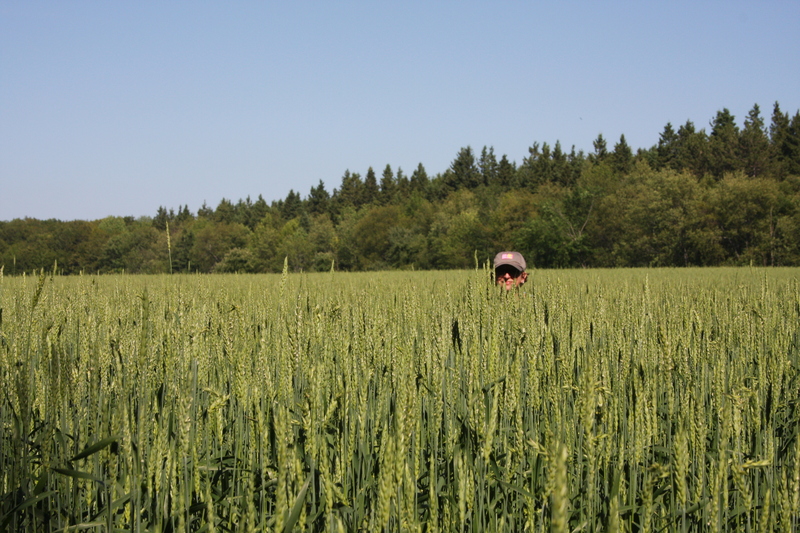 I spent 5 days at the CAO last weekend, driving up on Thursday to join Millie and Dietmar, then Ian. Before night fall I played with the Arduino and since the skies weren’t too clear we watched Hugo and I did my best to stay up late so that I wouldn’t be foiled by midnight on Friday, which had a really good forecast. I managed to sleep in until almost 11am, and once Blake arrive we walked part of the Lorree Forest Bruce Trail. Friday night was busy. 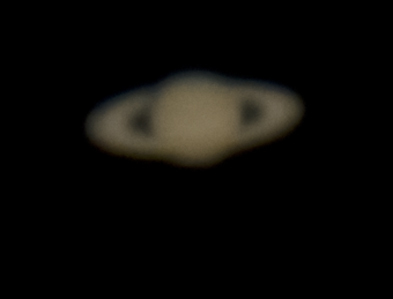 Ian started up the 14″ and opened the DBO roof early and I managed to capture some hand-held projection images during dusk with Saturn against a pretty blue sky [not sure which eyepiece was used]. These above are the same shot, horizontally flipped and rotated to match the real position of the planet in the sky, and the bottom one modified in Pshop to bring out some planet detail. 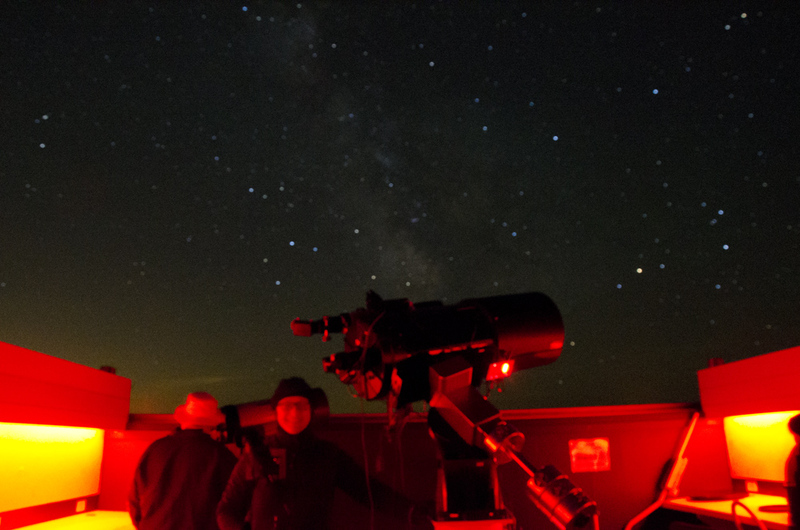 I set up my 8″ behind the 14″ and jumped back and forth to observe (Millie and I had quite a time trying to identify which moons we saw; there was a lovely triangular formation, but we figure one point must have been a star). Blake brought his dew heaters for me to use (thanks! ), and rightfully because it was just soaking wet out there. I’ll have to buy some when I visit KW scope next week (I’m giving a presentation, Sketching Saturn and the Milky Way, at the KW RASC club on Friday, June 28th, in lieu of making it to the General Assembly in Thunder Bay). I spent a bit of time yesterday with a short dSLR video clip and Keith’s image stacker, and while Keith’s served me well for my 2012 image, I really truly need a PC so that I can use Registax. So, no sample stacks just yet, though as I mentioned I have several GBs worth of footage to work with in the dead of the SK winter…. 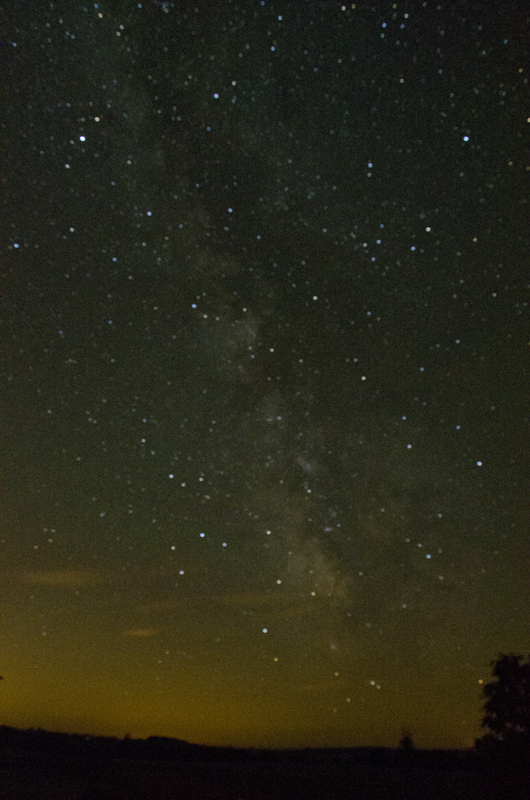 Steve McKinney inspired me to try some wide-field dSLR photos of the milky way, and also some time lapse. I need to play closer attention to all my settings, obviously, but I spent all day Monday reading the manual and playing around. I am still quite annoyed by the new Nikon lenses and cameras: there is no subject distance focus ring on the lens, and while the metadata will record details on subject distance that can be read after shooting (I use Bridge), there is absolutely no way, while shooting, to learn this figure in-camera. The focus ring doesn’t just ‘go beyond infinity’ – there is no infinity. The ring spins freely and endlessly in both directions, and the small catch, which can by spun over, changes position between AF and MF, i.e. the AF does not have a zero ring position which can be physically inferred when manually focusing. It’s really annoying. So, as you can see, none of the shots that I took are anywhere near in-focus. The solution is either: set focus to infinity in a lighted environment, and tape the lens in place; or shoot, view the metadata (power down, remove the card, put it in my mac, open the file) on successive files to try to get closer to infinity in the moment. Another possibility is to buy Lightroom (which I am uncertain will show me this information, anyone?) or, more expensive, the Nikon Camera Control 2 Pro software (can anyone explain why Capture NX 2 is preferable? ), to control the entire camera using the laptop, including, presumably, focus. 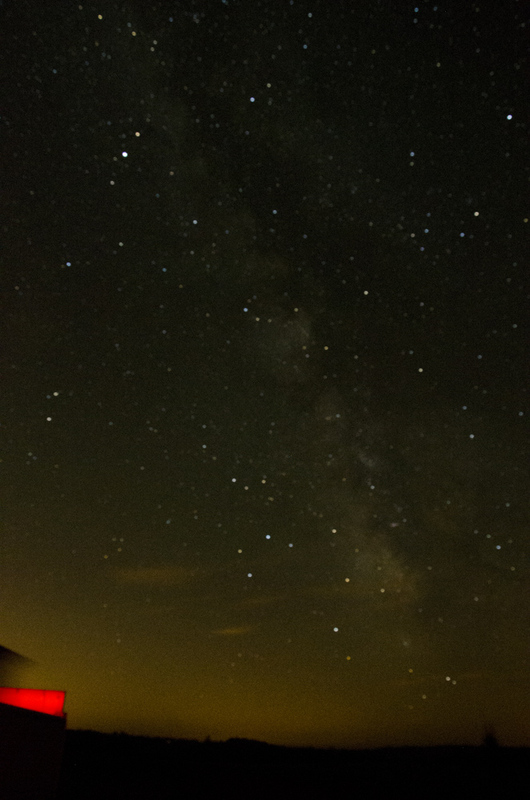 So, here are the two ‘best’ galaxy shots (one unmodified, one slightly tweaked). Dietmar suggested a colour temperature for shooting this kind of subject, but I forget (3400k??). He also suggested stacking. And a fun one of Ian and me in the GBO. Finally, for those who didn’t see my links on the list-serves, I saw an amazing storm Monday evening. 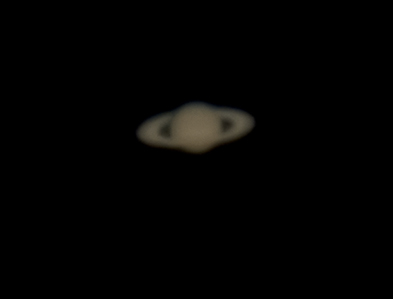 I didn’t manage to capture any images using my 8″ at the CAO, but I did set up at the DDO last night and collected a lot! That’s for another post….